Taylor Russell, Molly Parker, Toby Stephens, Max Jenkins, Ignacio Serricchio and Mina Sundwall star in Netflix's "Lost in Space." Warning: This review contains spoilers for Netflix's "Lost in Space," which premieres today (April 13) on Netflix. 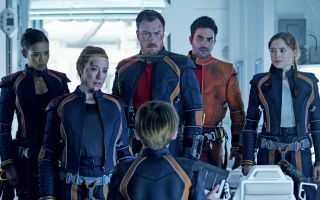 The best line from the premiere of Netflix's reimagined "Lost in Space" comes close to the beginning: "I should have read the fine print before I launched into space," one of the Robinson children laments. Following a crash on an unknown planet, the Robinson family is in big trouble. Mother Maureen (Molly Parker, who played Jackie Sharp in "House of Cards") is seriously injured in the crash. Father John Robinson (Toby Stephens, the villain Gustav Graves in the Bond film "Die Another Day") wants to help her, but has three frightened children he needs to issue orders to. Worse, the ship has landed on unstable ice, putting at risk all of the family's supplies — not to mention their shelter. "It's a concept of an Amundsen in space; survival is something that we really try to capture," screenwriter Matt Sazama told Space.com in a recent interview. Sazama was referring to Norwegian explorer Roald Amundsen, who led a crew on the first voyage to reach Earth's South Pole in 1911. The men traveled in challenging conditions, using skis and sled dogs to make it safely to their destination and back. A simultaneous South Pole expedition led by Robert Falcon Scott, which ended with the entire crew dying on the way back, demonstrates how much danger Amundsen's expedition actually faced. As the "Lost in Space" episode continued and the family faced mortal dangers, I couldn't help but think of the 2015 film "No Escape," which starred Owen Wilson, Lake Bell and Pierce Brosnan. It portrayed an American family on vacation in an unidentified country in Southeast Asia. The movie begins in pleasant circumstances, but degenerates quickly into a nightmare: The locals launch a coup targeting foreigners, and the family members flee for their lives amid gunfire and other threats of bodily harm. Like "No Escape," the first episode of "Lost in Space" features frightened children staring death in the eye, over and over again. Our culture usually portrays space exploration as a sort of vacation from the ills of Earth, but you're not going to see that here. Even the episode's flashbacks to the Robinsons' earlier lives provide little relief; you soon realize this family wasn't happy — or always telling the truth to one another — before they embarked on their risky voyage. After this premiere episode, I was left feeling a little battered. Yes, there was a temporary resolution, but the family will likely face more dangers in future episodes; I was genuinely worried for their mental and physical welfare. So, in that sense, I can't say that I truly "enjoyed" the episode. That said, I did connect with the family, and I'm definitely rooting for them. I want to see how the (so far) 10-episode series ends, just to make sure everyone ends up all right. Fans of the original "Lost in Space" television series (1966 to 1969) will note that not all of the main characters show up immediately. You won't see Robot until about three-quarters of the way through the episode — and even then, the machine's intentions are not as clear as its predecessor's. And it won't be until the end of the episode that you'll finally the shady Dr. Smith (Parker Posey, who played Kitty Kowalski in "Superman Returns"). She only has a few minutes on-screen, but I loved the element of surprise about her. You're never quite sure what she's going to be doing next. In a Wondercon panel covered in Deadline, Posey said she is glad Dr. Smith is a woman in this reimagined series, instead of the man who was in the original. "I love the original [series], and I certainly love the original Maureen," Posey said, referring to the mother character. "But we live in a different time of gender dynamics. The women [on the show] could do whatever the men do — it isn't even a question. It's just the reality. It's incredible to play a woman as smart as she, [who], at the same time, has these flaws and has to connect with her kids." Watching the premiere, I was impressed by how professional the children are in the family's dire straits. Little Will Robinson (Maxwell Jenkins, from "Betrayal" and "Sense8") is very frightened, but like a true astronaut, he keeps recalling his training. Watch for the scene where he's examining some machinery, alternating between detailed, adult descriptions and visceral, child-like fear. Judy Robinson (Taylor Russell, from "Falling Skies"), despite her young age, is a trained medic who can do field medicine in the most challenging of circumstances. We don't see as much range from Penny Robinson (Mina Sundwall, "Maggie's Plan"), but there is a cute scene where she compares cutting steak to performing surgery. I'm sure we'll see more of her abilities in future episodes. While most of this first episode focused on drama, the screenwriters told Space.com that the series will also emphasize science. For example, it's little Will who realizes that his family can use magnesium to solve a problem they're facing on the planet. There also will be some discussion of the ion drive the mothership used to bring the colonists on their long journey, the screenwriters said. "We want to make the audience do the research along with you," said screenwriter Burk Sharpless. To those who watch the new "Lost in Space," hang in there. It's a difficult journey for the Robinsons and for viewers. But I have confidence that the Robinsons in the new series — just like the ones in the old show — will truly stick together, no matter the odds. The first season of "Lost in Space" is available now on Netflix.